I stepped out into what looked like a snow globe on Saturday afternoon. At first I was hesitant to take pictures in the snow. I wasn't sure if the lighting was going to cooperate, but it actually ended up setting the tone for an ultra soft shoot. After a few minutes outside snow started piling up so we had to finish the next day. Hence why the photos about halfway down look drastically different, and perhaps a little more sunny. After a busy week of NYFW events, I was so excited to spend a majority of this weekend inside snuggled up on my couch. I always feel super inspired this time of year because of fashion week, but this season it was really difficult to dress warm and feel somewhat fashionable. It was 1 degree last weekend and when the wind blew it felt -12 degrees. What does one wear during this weather...besides a snowsuit?! You pile on lots of fur (or faux fur in my case) and double up on pants. That's what you do. Yes, I really wore two pairs of pants to a fashion show last week and prayed my legs didn't fall off from hypothermia! All cold weather jokes aside, I wore the exact outfit above to Reem Acra's runway show last Monday night. It was the perfect amount of leather and faux fur sass. If you are looking to create an eye-catching outfit, try adding an edgy accessory like this Dear Diary clutch from Skinny Bags. It's most definitely buzz-worthy and trust me, the street style photographers will love it! Make sure to follow Skinny Bags on Twitter, Instagram, and Facebook for more style inspiration. Adorable outfit Jess and I love the snow. So gorgeous! You look so cute in the snow...love that jacket! Oh yes, (faux) fur is always in ;). Thanks for your sweet words! Gorgeous and I need this whole outfit! The bag is freaking amazing. And I bet that faux fur jacket kept you warm in the snow! Jess - Gorgeous pictures. 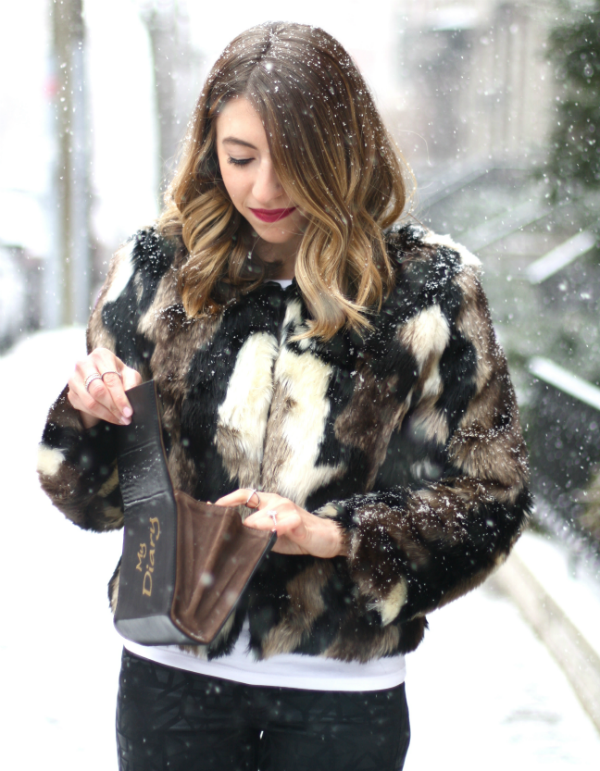 Love your outfit and specially the faux fur and the clutch.